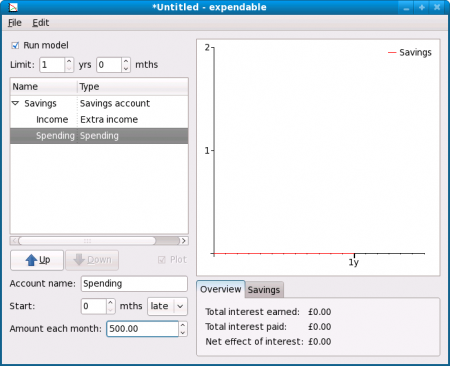 Now expendable can make calculations for stoozing as well. 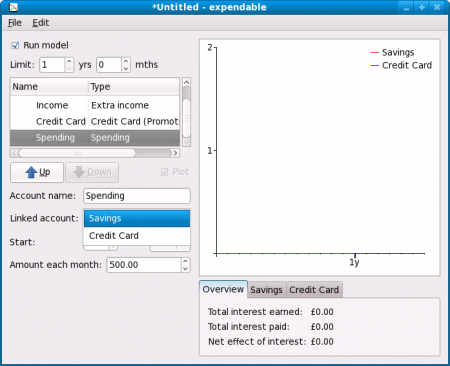 Stoozing, if you haven’t heard that word, is when you pay for things on a credit card that charges 0% on purchases so that the amount you would normally pay off the card with each month is moved into a savings account instead. 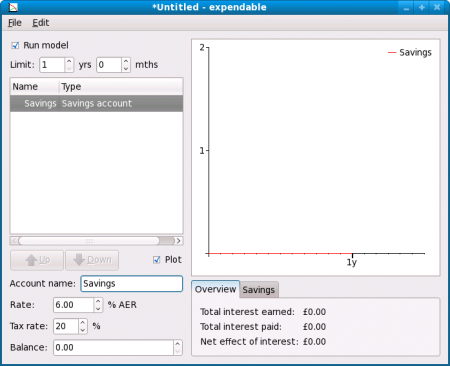 This way you can earn interest until the 0% period ends. Here’s an example. 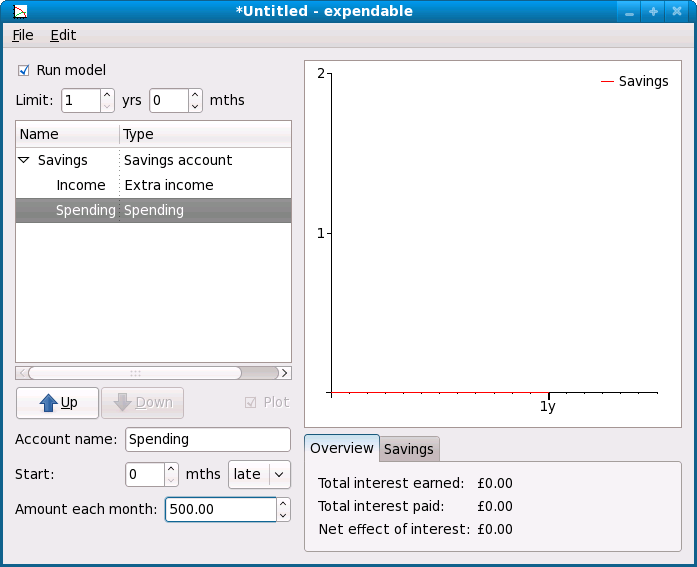 First, start expendable and create a new account tree with a savings account in it. Set the interest rate to, say, 6% AER. Limit the modelling period to 1 year. Now we want to add income and expenditure. Let’s say we’ll be spending all of the £500 that comes in each month. To do this, add a new account of type “Extra income” and set the amount to 500, then add a new account of type “Spending” and set the amount to 500. Our savings balance remains at 0. Now we want to put our spending on a 0% credit card. Add a new account of type “Credit Card (Promotional Rate)”. For this example we’ll leave most of the settings at their defaults: 0% interest for 12 months, with 3% or £5 to pay off each month. Let’s adjust the limit to £3,000 though. 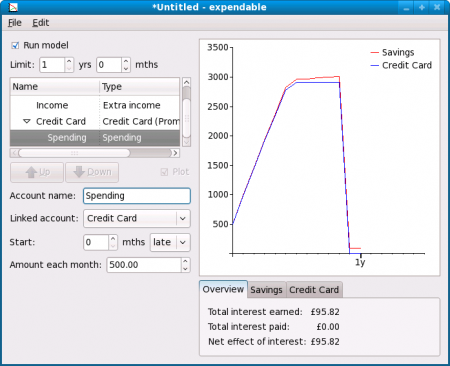 To move the spending onto the credit card, select the spending account and change its linked account. Now you’ll see a graph showing the balance of the savings account and of the credit card for the first year. In this example we’ve earned over £95 by stoozing. Notice how the credit card balance gets near to the limit and then stays there: this is because each month we are paying the minimum payment, and are able to load the same amount again onto the card at 0%. 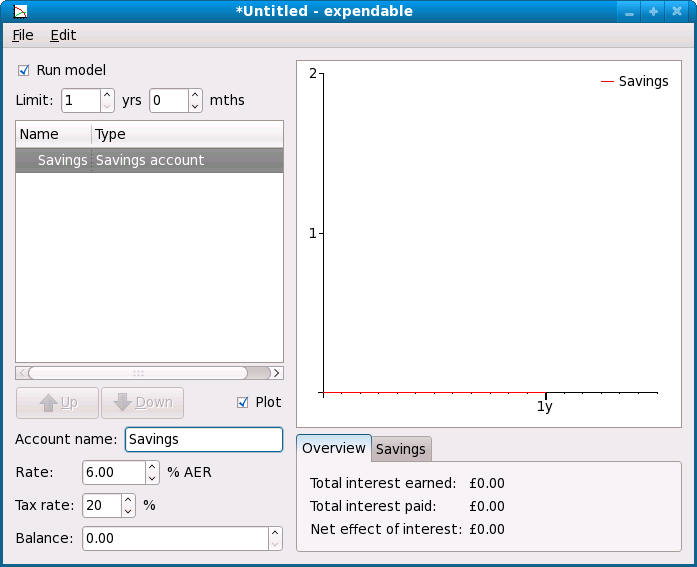 When the limit is reached, the remaining amount to be spent is taken from the savings account. This entry was posted on Wednesday, October 15th, 2008 at 6:38 pm	and is filed under Software. You can follow any responses to this entry through the RSS 2.0 feed. Responses are currently closed, but you can trackback from your own site.